How to Get Your Blog Indexed? After you create a blog and start publishing the content, the next thing you want is people to find it. One of the ways visitors will find your blog is through search, but for this to happen, your website has to be indexed. 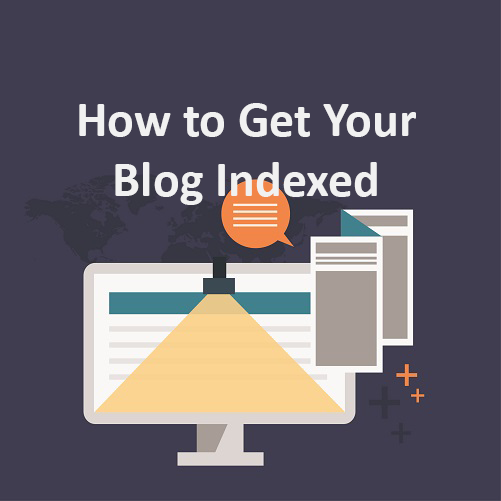 Therefore, you need to understand what does indexing mean and how to improve chances of indexing your blog as quickly as possible. What does it mean to index a page? New content appears online every minute and search engine bots are constantly visiting pages on the internet (crawling) and reading their context in order to index it. Once the page is indexed, it becomes a part of Google’s gigantic database and it can be included in the search results when associated with the relevant search query. When it comes to finding and indexing new pages and blogs, search engine bots, also called crawlers, start crawling pages that are already in the database, and then they detect links to the new content. This means that links to your blog, as well as a sitemap are crucial for search engine bots to index your content. The first step that’s going to help you to get your blog indexed is a sitemap. A sitemap is basically a collection of all the pages on your blog grouped in a single file, enabling search engine crawlers to detect links easily and thus successfully index the content. When the search engines crawl your blog, they’ll discover all the pages through the links in the sitemap. The power of a sitemap lies in creating a certain internal structure which becomes more and more important as your blog grows. Having in mind that search engines don’t see blogs and websites the same way as users do, this internal structure in a form of a sitemap is the way to successfully present your content in the form the search engines would understand. Understanding and being able to “read” content is essential for search engines to index it and include it in the search results. The process of creating a sitemap is quite straightforward as all you need is a tool to help you with this. One of the most commonly used tools for this purpose is XML Sitemaps Generator. Besides creating a sitemap with a tool, there are blog plugins that will automatically create and update the sitemap as you update your blog. If your blog is hosted on the WordPress platform, you could use the Google XML Sitemaps plugin, or JSitemap if you use Joomla. While creating a sitemap is going to allow search engines to index all the pages of your blog, it doesn’t mean this is going to happen immediately. For this to happen, search engines need to discover your sitemap first. Search engines need time for this process, but as you’ll probably be eager to get your blog indexed as soon as possible, here’s a way to speed things up. Sign up to Google Search Console and use “Add a property” button to add your blog. Before you can continue, you’ll need to verify your blog with Google Search Console. 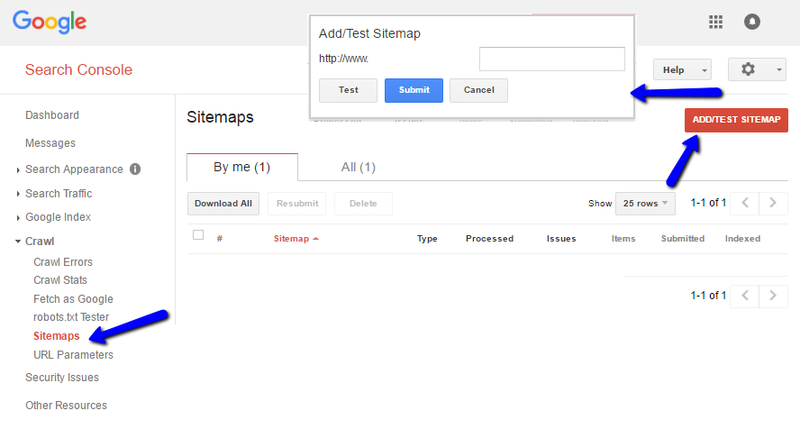 Once your blog is added, you’ll have an option to add/test a sitemap. What you need to do is to add the URL of the sitemap page, click on “Submit” and this will be a signal to Google that you have a sitemap that needs to be indexed. In case the file is invalid or crawlers can’t read the page for some reason, you’ll get a message about this issue, so you can resubmit the sitemap. Your blog pages will get indexed by the search engines eventually and have in mind that this is an automatic process. There’s no need to do any submitting to search engines manually, but there is such an option. If you notice that search engines are taking too long to index your content or you want to make sure you’re doing everything possible to get your blog indexed quickly, you might want to use this option and submit the URL yourself. You can easily submit your blog using the Google’s page for URL submitting. Have in mind that the request can’t be processed immediately, nor does Google give any guarantees that it will in fact index the URL. Bing allows adding your URL to Bing search engine the same way Google does. 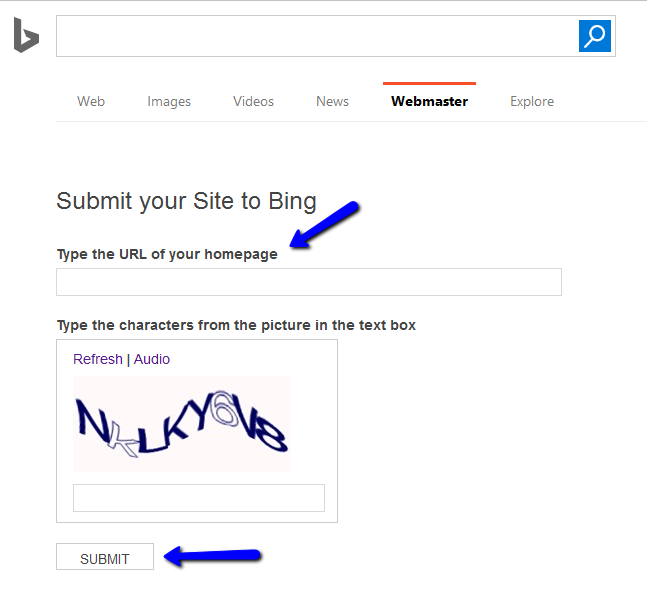 All you need to do is provide the URL and you can quickly submit URL to Bing. Since Yahoo is owned by Bing, this process ensures your blog is submitted to Yahoo at the same time. While links from social media aren’t perceived the same way links from other blogs or websites are, search engines still take into account these so-called “social signals”. Therefore, one of the ways you can boost this process of your blog getting indexed is to add the link to social media. Start by adding the homepage link to all social media accounts. Description box is usually the best way to do so, or the platform might have a specific field for adding the URL. If possible, always go for the social media username that matches your domain name. You can then share the specific blog links as status updates, but make sure your posts are set as public. Posts are usually set as public by default with most social networks, but you can always double-check in the account settings. Now try to get your posts shared by other social media accounts using different social media strategies. The goal with all this is to get as many social signals as possible, which are one of the indicators of quality content. Besides social media, social bookmarking websites could also help you spread the news about your newly-launched blog, so check out a couple of those and add your blog homepage, as well as the URLs of the actual articles. There are hundreds and thousands of social bookmarking websites, but a couple of those you could check out include Reddit, Delicious, StumbleUpon, ScoopIt, etc. Using the RSS feeds resembles social bookmarking websites in a way that you collect and organize the links you like. The advantage of RSS feeds over social bookmarking websites is the fact that once someone saves the link in the RSS feed, it’s automatically updated once new content is added to the blog. This is a great way to gain loyal readers, so make sure you explore this option when setting up your blog. Find out how RSS works and how you can use it: A really simple guide to really simple syndication (RSS). Google allows you to add the URLs to its own RSS management tool. Simply log in to your Google account and add the link to the Feedburner. Adding your URL is another way of letting Google know that you have a new page that needs to be indexed. Links have always been an important element for indexing and ranking websites. Not only do search engines use links for crawling and discovering new content, they also see links as a sign of trust. This means that if a popular website links to your blog, search engines will perceive your content as relevant and worth sharing. Under the assumption that no one wants to link to a spammy, low-quality content, search engines use links as one of the indicators of content quality and relevance. As much as links are important, especially at the beginning when you want your blog to be indexed as quickly as possible, links aren’t always easy to obtain. The best case scenario is to have another website or blog linking to your content without you meddling. This might be difficult at the beginning, when you don’t have a lot of visits and when hardly anyone knows your blog exists. However, you can always reach out and try to obtain links yourself. Guest blogging or sponsored posts are some options you might find worth exploring when trying to find link building opportunities. You could also host giveaways to gain more links and exposure. Blog commenting and forum links have also been used for the purpose of gaining links, but it’s been a dilemma how worthy they are in the eyes of the search engines, since those are the links you post yourself. Submitting the homepage URL to directories is another solution for obtaining more links. Have in mind that there are thousands of directories, but be selective when choosing the places where you want your blog URL added, as some directories might be associated with spammy content, and you don’t want spammy websites linking to your blog. Here is a useful list of blog directories you could consider: 131+ Manually Verified Free Blog Directories To Submit Your Blog. Just as much a sitemap can help with indexing content, interlinks are also helpful for “communicating” with the search engines. Firstly, having interlinks allows search engines to discover new content on your blog through content that has already been indexed. As said, crawling is a continuous process so the search engines continue to index pages from the pages they indexed during the last indexing process. Use internal links to link between similar content, to feature latest posts, or content that is somehow relevant to the newly published page. The second reason for interlinks is the importance of anchor text. Not only do you increase the number of indexed pages through interlinks, but interlinks will allow search engines to understand the content you link to in a better way, as you’ll use relevant anchor text for the interlink. Blogging communities, such as NetworkedBlogs, Triberr, are excellent for spreading the news about your content and getting in touch with other fellow bloggers. This eventually helps you build your reputation, get more shares and links to your blog, which is why this strategy will indirectly help with indexing, as well as with positioning your blog. Besides web-based communities, you can discover many more blogging communities among Facebook or LinkedIn groups, and among Google communities. Although they might not be as effective with indexing, they can still bring you exposure or new contacts. While the above practices are something you can do immediately, once your blog is live, there are some things you can do which might take more time, but are guaranteed to lead you to your goal – getting your blog indexed. Start by adding enough content, and try to keep the regular pace. Once search engines index your blog, and they notice that your blog is regularly updated, they’ll visit it more frequently in order to index all the new pages in a timely manner. Apart from keeping your blog fresh with new content, think about optimization as a way to basically “talk” to the search engines. Through website optimization, you “explain” to search engines what your content is about and this allows search engines to index content in a better way, thus relating it to relevant search queries. Optimization elements you should think about include keywords, headings, title tags, etc. The bottom line is: you’ll need patience. As much as you wish your blog to be seen by the search engines immediately and shown in the search results, this is still a process that takes time. By using the tips above, you can certainly speed up the process, and what’s more important, you’ll spread the news about your blog along the way, gaining audience and followers which will help you with growing your community and becoming an influential blog in your niche.